Jonah Hill of Superbad fame was nominated for an Oscar. Albert Brooks wasn’t, despite his riveting turn as a crime lord in Drive. Read more about who will and won’t be walking the red carpet. The following is a complete listing of this year’s Academy Awards nominees. For the top eight categories, we’ve included each nominee’s name along with a list of the accolades that have already been won from awards shows, film critics associations and the like. As a bonus, we’ve posted betting odds as calculated by historic London bookmaker Ladbrokes. Rio Rancho’s waste is being wasted. The same is true for most cities, which treat their sewage well enough to be used for gray water purposes but then send it downriver. Due to the plight of the desert and a rapidly growing population, Rio Rancho no longer wants to send off its sewage. New Mexico is the longtime world heavyweight and still national champion in deaths by drug overdose. But lawmakers passed a landmark memorial that could put a dent in the yearly death toll. A megaphone made of cash. That’s what Stephen Colbert sought when he created his super PAC in a satirical dismantling of the Supreme Court’s Citizens United v. Federal Election Commission decision. Not a lot of New Mexicans get the opportunity to attend the Red Carpet Soiree to End All Red Carpet Soirees—otherwise known as the Academy Awards. Most of us simply watch from the decidedly unglamorous comfort of our living room couch. But this year, the city of Albuquerque is teaming up with the Academy of Motion Picture Arts and Sciences to bring us the closest thing to being there. 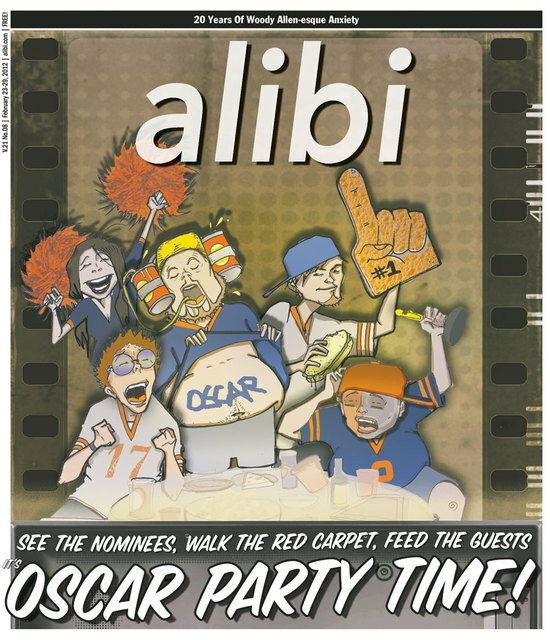 Oscar Night America is a series of officially sanctioned Academy Awards parties held in 49 cities across the United States. The events are done in conjunction with the Academy’s philanthropic arm, allowing proceeds to go to various charities around the U.S. Albuquerque is one of the elite few hosting one of these Oscar Night parties. The event will take place this Sunday evening as a benefit for Friends for the Public Library and the historic KiMo Theatre. Given the continuing success of vocal talent competitions like “American Idol,” “America’s Got Talent,” “The X Factor,” “The Voice,” et al, Americans are obviously obsessed with people who can carry a tune. So far, though, Hollywood hasn’t been able to translate that into anything other than “let’s all vote on America’s next pop star.” FOX’s “Glee” briefly captured the drama of stardom-seeking in fictionalized form, but the show’s writing continues on a tragic downward trajectory. The movie industry, meanwhile, has yet to fully convince audiences they actually want to see a full-fledged musical. (Nine? Burlesque?) Hell, even Broadway has a hard time holding onto shows that aren’t “jukebox” musicals filled with pre-popular songs by well-known groups like ABBA or Green Day. So what’s next? Instead of scribbling notes and taking tests, the students at Albuquerque’s Public Academy for Performing Arts’ media program decided to make their own feature film. The end result, a 60-minute movie called PAPArazzi, will make its public debut on Thursday, Feb. 23, at Guild Cinema. The film tells the story of two ambitious performing arts school students doing battle with one another to get their hands on a coveted scholarship. The film will screen at 5:15, 6:15 and 7:15 p.m. Of course, the cast and crew will be in attendance. To help out, Guild next-door neighbor Il Vicino pizzeria has offered to donate 20 percent of its sales that night to the school’s media program (if you mention PAPArazzi). So come out, have dinner, watch a movie and support Albuquerque’s next generation of filmmakers. Don't let money change ya. That's the message of "Deception," arguably the most well-known and anthemic track by Bay Area duo Blackalicious. It's also a creed the group's vastly skilled, tongue-twisting MC Gift of Gab (née Timothy Parker) seems to have taken to heart. He’ll be headlining a show at Burt’s Tiki Lounge next Wednesday. The Alibi caught up with him in advance. [photo]UNM linguistics professor and actor Alan Hudson was sitting at El Pinto. It was March 2010, and he'd just seen a performance of The Diary of Anne Frank at The Filling Station. He was surrounded by people involved in the production. As theater talk filled the air, Hudson recalls prominent local actor and director Brian Hansen offhandedly proposing the idea of an Irish theater festival in Albuquerque. "That kind of lit a fuse of some sort in my brain," says Hudson, who was born and raised in Dublin. Albuquerque writer John Bear reviews German writer Ingo Schulze’s biblical take on adultery and communism. Whether it’s with a pearl-handled .357 Magnum revolver or a Canon EOS 7D, folks in the 505 are quite fond of shooting things. And while images of Hunter S. Thompson blasting a typewriter to pieces is alluring to my inner vigilante journalist, the truth is I’m more prone to shutterbuggery than gunplay. Take that as a good thing, as I’ll be conducting the Alibi’s ninth annual photo contest. So go ahead. Give us your best shot(s). Here are the rules. ARIES (March 21-April 19): I invite you to identify all the things in your life that you really don't need any more: gadgets that have become outdated, clothes that no longer feel like you, once-exciting music and books and art works that no longer mean what they once did. Don't stop there. Pinpoint the people who have let you down, the places that lower your vitality, and the activities that have become boring or artificial. Finally, Aries, figure out the traditions that no longer move you, the behavior patterns that no longer serve you, and the compulsive thoughts that have a freaky life of their own. Got all that? Dump at least some of them.